What In The Hell Was I Thinking? There is nothing like six hours out on a classic boat that can’t solve all the worries of the planet. 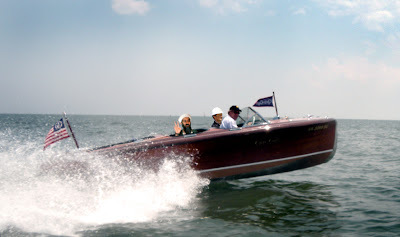 I swear if I could get Osama out on an old Woody Boat he would change his point of view. The CEO of BP would come up with the perfect solution to plug the oil spill, Democrats and Republicans would actually agree on things, and my wife would actually start laughing at my dumb jokes again..What is more important is that it will remind you why you spend the majority of your time taking care of your classic boat. I realized at about hour 4 while ripping around a corner at full throttle that this ain’t bad.. That old Sylvia was performing like a champ and this was fun again. Thank god for warm weather and long boat rides. The shot above was taken by fellow Woody Boaters Jimmy and Lynn while out on there magnificent freshly restored Chris Craft Riviera.. WOW! More on her later… I need to get some photos that do her justice. More Emotion In The Air. It's that WoodyBoater fever kicking in full strength. You know there's no known cure so why fight it? The photo that you posted says it all, great shot! So are we playing "Wheres Waldo" in that photo? I'm green with envy. I too need a boat ride. I guess I better order more varnish and get busy.